These top finalists were selected after a voting by an elite panel of jury who rated each individual and we got the TOP 6 for Voting. Now you can vote for your personal favorite and see him as this year person of the year 2010. Tanvi Doddanavar- created history by winning the gold medal in 200 mts backstroke event being held at Kolkatta at the All India University competition. She is studying at the Gogte college of Commerce. Mrs. Anita Rodrigues – The founder of Karunalaya, a Home for the dying, destitute, poor and abandoned of the city of Belgaum and its surrounding areas. Deepak & Dinesh Dhadute– of Servocontrols India Pvt.Ltd.for taking Belgaum on the global map of aerospace industry and the only company in India for Design Aerospace Standard AS9100 Rev B company. consumer goods business and also spends most of his time for his orphanage AADHAR. He has been involved in serving HIV+ patients and now also takes care of Orphans and HIV+ patients at his AADHAR under his Mahesh Foundation. Narendra Murkumbi—— Co-founder, Vice Chairman and Managing Director of Shree Renuka Sugars for his foresightedness and for two acquisitions in Brazil & also for being selected the ET Entrepreneur of the Year and also in the Super Rich. Raghvendra Anvekar— The differently abled swimmer for winning Eklavya Award & Bronze medal at Para Asian games 2010. He has has so far won 18 International Medals apart from 43 gold medals at the National competitions. At present Raghvendra is studying in RPD College, Belgaum. Nominees:	Based on the emails received from the Belgaum public in the form of nominations that need to be awarded, all nominees achievements and profiles will be carefully evaluated by a hand picked jury chosen by AAB. 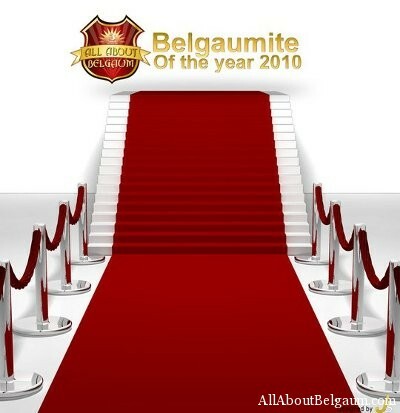 A filtered list of six nominees would be chosen by the AAB jury and will be put on AllAboutBelgaum.com on the 24th of December 2010 for public voting. Winner:	One Event Winner arrived at through evaluation by means of online voting by the public from 24st December 2010 to 01st January 2010. Jury: Group of persons selected by the Event management who will evaluate the Applicants, Contestants and Nominees. The jury consisted of 46 people from various backgrounds, age groups. Sir, you have dropped one of the most important person in belgaum Dr.Mahantesh .Ramannavar. He has made a history in the medical field by disscting his own fathers body and created awareness regarding body donation amongst all over the world . Thank you UDAY for such a great initiative & for bringing the nominees of Belgaum on webspace. Anyways I would like to vote all of the nominees out there but it doesn’t work like that 😉 So I would be voting a person who has really served the needy and thats a confidential vote from me. Anyways great going people and hope to see you flying globally with great colors. technocrat.Abdul Kalam of belgaum ! I wish I am granted one more right to vote. There are two people who deserve a vote. My vote goes to Anita Rodriguez! Be Blessed Anita! My vote goes to "Mrs. Anita Rodrigues " i feel this is one of the greatest service one can do to humans . my vote goes to tanavi doddanavar. My vote for the Belgaumite for the Year-2010 goes to Mr. Narendra Murkumbi. i see daily news pepar in belgaum daily one news pepar carried the news of aadhar or mahesh jadhav. this person doing great work for orphans,HIV+ people & children's & others also. so im requested to all ABB readers please vote "AADHAR"
"Men are rich only as they give. He who gives great service gets great rewards". so Mahesh Jadhav doing the work to society. Karunalaya Rocks!!!! Visited it and seen the care and love that is given to the old and the neglected. Mrs Anita and her staff do an amazing job to make sure that the inmates are given the best treatment. I wish Mrs Anita Good Luck. keep it up Mahesh Jadhav. While others of your age are enjoying life, you have got into serious business of caring for the suffering. Great job. Its really Aadhar (a Shelter of trust,love n care ). and i request people to support him n help. Hi Uday, I have serious objection to Mr. Murkumbi's nomination. In general, people who are owners of "For Profit" business are not considered eligible. What would matter is how much of the fortune Mr. Murukumbi has given-up or giving on a regular basis for humanitarian needs and other development projects like assisted living for old and needy, sports awareness, etc. I am not sure how he is he even nominated. I will take my words back if you post information on Mr. Murukumbi's charitable work. Regards. I fully share your views! all the best Mahesh Jadhav & "AADHAR" home for homeless. hEy tAnvi… . .. .
w!sH yU OL tHe bEst. .. . .
yU v!L w!N. . .
wE OL Arr w!d yU. . . .
gOod Luck. . . . .
Tanvi has won 41 National Medals so far in her swimming Career. we have our cousin Raj k Purohit, who has made Belgaum proud. The kunda boy at Silverscreen. He has made belgaum proud,working for many serials and Films. Pl chk his Portfolio. There is nothing great in acting in films ! It is a profession like any other profession to earn livelyhood. That is it !